Jimmy Crespo of Hartford received a new pair of Wolverine boots as part of a winter charity effort put together by Footwear With Care. That nonprofit held a 'Winter Boot Party' in Hartford Saturday, December 8, 2018. "[It feels] good and perfect," said Brevilon Dieuquifaid while getting his first-ever foot massage. The rubs were given out for therapeutic reasons during a charity event for Hartford's homeless population on December 8, 2018. A local nonprofit outfitted about 400 people with a brand new pair of boots and a fresh pair of socks at an event called the “Winter Boot Party” at the Christ Church Cathedral in Hartford Saturday. The event, put on by Footwear With Care, benefitted Hartford’s most vulnerable population – those experiencing homelessness. Abby Sullivan Moore, founder of Footwear With Care, said the need for decent foot wear is most intense in the winter. Jimmy Crespo, 61, was fitted for a new pair of Wolverine boots that were size 10 1/2 inside the church’s annex. He couldn’t have received them at a better time -- he said he bounces around from place to place. “I like what is happening here because I’m kind of homeless and this church here is helping me out for the winter time,” Crespo said. The feet of Brevilon Dieuquifaid, a 42-year-old man experiencing homelessness in Hartford. 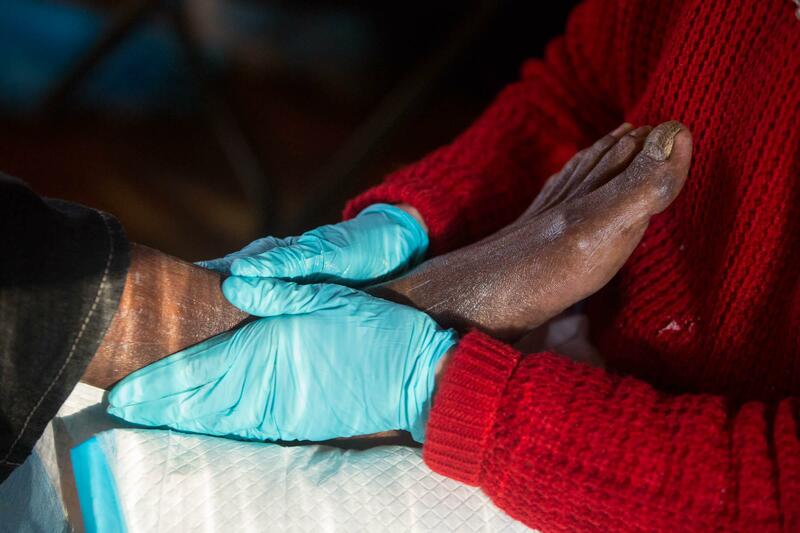 Brevilon Dieuquifaid, 42, received his first-ever foot massage at the event, which he said felt “good and perfect.” Dieuquifaid is also a person experiencing homelessness in Hartford. “It’s [good what they’re] doing that for homeless people because they don’t have anyone out there and being in the cold like that is not easy,” Dieuquifaid said. The foot rubs and the exams were all a part of Moore’s wish to serve those in need in a warm and friendly atmosphere. As part of that aim, Jimmy Crespo got a foot exam and was fitted with an orthotic to go with his new boots. “There’s a lot of homeless people here and the clothing, especially these brand-new boots – they’re nice, warm, and comfortable,” he said. His new friends that hooked him up with the new Wolverines tried to take the tags off them for him. He told them to leave them on. “It’s a fashion statement,” he said. The winter boot party was so well-attended that not everyone who turned up could come inside and get new boots. Moore said her group will try to get to them in the coming weeks. Last year, the number of homicides in Hartford was lower than in 2015. But murders in Connecticut’s capital city were up from 2016, including a spike in one Hartford neighborhood.